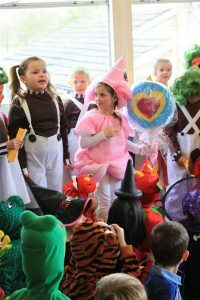 The children came to school on Wednesday dressed in amazing and creative costumes, as characters from Charlie and the Chocolate Factory. There were enough Oompa-Loompas to run a chocolate factory and Bella absolutely delicious as candy floss. Anna came as the chocolate bar with basket of sweets, and the Golden Ticket! She found sitting down difficult but looked amazing! The children spent the day working book inspired tasks like designing own sweets and giving change in the factory shop. They also designed and made an edible hat for Willy Wonka!